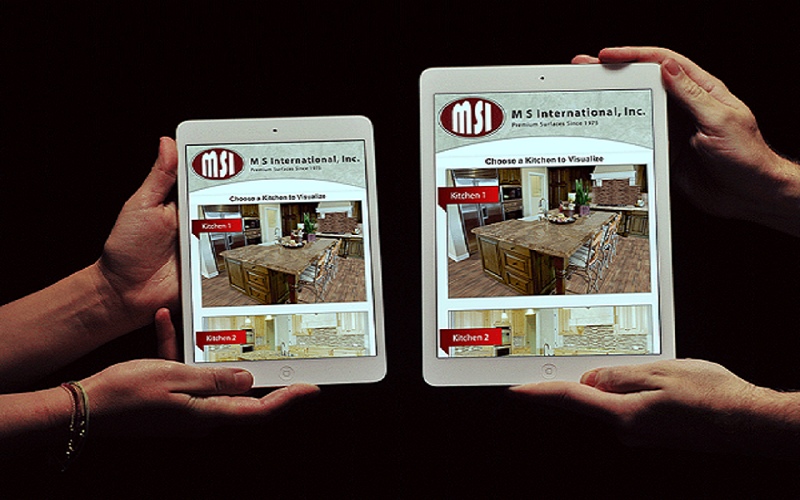 M S International, Inc. (MSI) announces the launch of their popular Kitchen Visualizer tool optimized for the iPhones and iPads. The Kitchen Visualizer App features all of the same functionality that customers have become accustomed to on MSI’s web-based Kitchen Visualizer, including four kitchens to choose from, hundreds of countertop, flooring, and backsplash options as well as a dozen cabinet colors. The Kitchen Visualizer for the iPhone and iPad app allows designers and homeowners to visualize the multitude of options available directly on their Apple mobile devices. Using the app, customers can expect even faster speeds along with an easy mobile design experience. MSI recommends that fabricators encourage homeowners and designers to download the Kitchen Visualizer iPhone App prior to meeting with sales professionals. To create a cohesive and elegant kitchen design, homeowners can select cabinet color finishes, backsplashes, flooring, and countertops, and develop a number of options to preview at a local MSI distribution center. 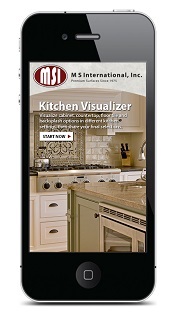 To get started, download here and install MSI’s Kitchen Visualizer for iPhone and iPad app from the Apple App Store. Next, select one of the four kitchen layouts available. The app is user-friendly, easy to navigate and quick to render user choices. Users select the countertop of choice, the color for the cabinets, the backsplash, and the flooring to help select the products that appeal to their design aesthetics. The MSI Kitchen Visualizer iPhone App allows designers and sales professionals to help customers easily envision their ideal kitchen, in the showroom, and during in-home consultations. About M S International, Inc. Founded in 1975, MSI is a leading nationwide distributor of flooring, countertop,decorative mosaics and wall tile, and hardscaping products. Headquartered in Orange, California, MSI also maintains distribution centers across the United States and Canada. MSI's product line includes natural stone products imported from over 36 countries on six continents. In addition, MSI carries an extensive offering of porcelain, ceramic, glass and quartz products. The company maintains an inventory of over 125 million square feet. For more information on MSI, visit msisurfaces.com.